Now that I’ve set the table by offering a glimpse into both the kinds of birds and kinds of birders one might see at the Rio Grande Valley Birding Festival, let’s talk about trips. That’s right, these are the hotspots for White-collared Seedeaters north of the border. Now, I’ve seen these frisky little seed-snatchers before, most memorably at the Hotel Villa Maya, my Guatemalan birding paradise, where the photo above was taken. But faced with the opportunity to exceed Corey’s impressive ABA count, I decided to bank all the birds I could! That’s how I wound up two hours before dawn on a bus bound for the Zapata Town Library. At least I was sitting next to Eva of The Flying Mullet, someone I’d been looking forward to meeting in person. On this, the first day of the festival, my fellow avinauts were as eager as I to sample the splendor of RGV avifauna. I should note for the record, though, that even though I arrived in Texas after nightfall, I was still fortunate enough to rack up a lifer. Terry Fuller took me, along with Katie and Kristin of Eagle Optics, spotlighting for Common Paraque through the back roads of San Benito. Not only did I enjoy excellent views of this natty nightjar, I also spied an Eastern Screech Owl in a sabal palm; since this owl was of a Mexican race that might one day be granted full species status, I may just have a new bird in the bank! As I was saying, we were all hot for some new birds. The slavering pack of twitchers somehow managed not to stampede towards our anticipated seedeater spot, held in check no doubt by a mortal fear of scaring the bird off. Our intrepid leaders, Jeff Gordon among them, might have had something to do with that as well. The leaders were certainly instrumental in ensuring that everyone caught at least a glimpse of the coveted seedeater skulking in a bushy stand of giant cane. No view was anywhere as good as the photo above, but at least we could all focus on other species like Green Jay, Ringed Kingfisher, Blue-gray Gnatcatcher, Lesser Goldfinch, and, of course, plentiful Great-tailed Grackles. 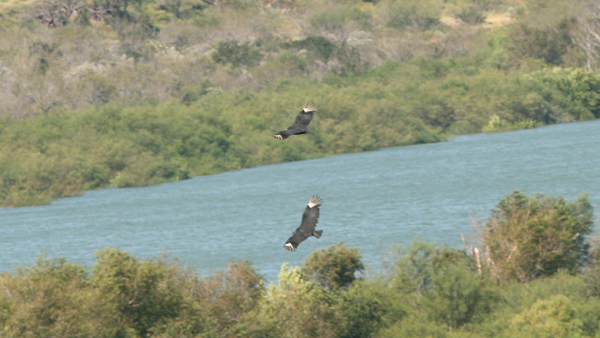 The Rio Grande Valley is raptor heaven. Not only do American Kestrels and Merlins populate most telephone wires, larger birds of prey like accipiters (Cooper’s and Sharp-shinned) and vultures (Black and Turkey) turn up everywhere. This was my introduction to both Crested Caracara and Harris’ Hawk, but by the time the trip was done I knew them exceedingly well. Gorgeous birds! With mission accomplished in Zapata, we moved on to San Ygnacio. A very kind couple was waiting for us on their spacious balcony and coffee was brewing. The fact that their concrete veranda overlooked a lush riparian forest that was managed as a seedeater sanctuary sweetened the pot. We didn’t spy any seedeaters there, but did get great looks at a champion skulker, Olive Sparrow. This sparrow may appear drab in photos, adorned as it is in grays and greens, but I love those rufous crown stripes and the muted flash of its olivine wings and tail. …I don’t even know what this ode is! Small consolation indeed. With at least half of our number buzzing with excitement, we took lunch at a high promontory overlooking the Rio Grande, and beyond that Mexico. Anyone who hadn’t already gotten eyes on Chihuahuan Raven, the corvid king of the Chihuahuan Desert, enjoyed great looks here. And while we saw plenty of vultures and Cattle Egrets, conditions were too windy for our target desert species so we moved on elsewhere. Alas, that last leg of the journey was equally inclement for species like Verdin, Scaled Quail, or Pyrrhuloxia but at least we picked up Bewick’s Wren, Vermilion Flycatcher, and a surprise flyover of Greater White-fronted Geese. On our long journey home, I put the day’s take at 5 life birds and an equal number of new ABA species, whereas participants with less exposure to the western U.S. and Mesoamerica doubled or tripled that tally. And this was only the beginning of the week. You’ve got to love the Rio Grande Valley! Hey you…did you see the heart shape under the grackle on the pole…that is pretty sweet. It would be a nice valentine. 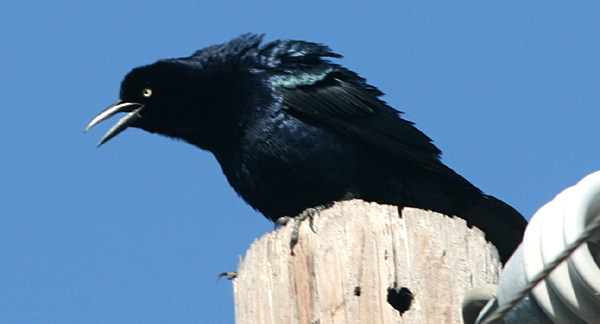 Great tailed grackles are sure charmers with the ladies. Liz, you’re a true romantic!